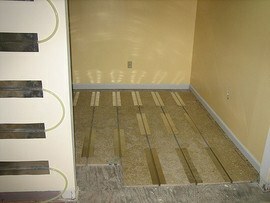 Hydronic radiant flooring is the most commonly used and most cost-effective type. It is generally more efficient than forced-air or baseboard heating. Electric radiant floors usually save money only if they are combined with a significant thermal mass (i.e. a thick concrete floor) and only if your local electric company offers time-of-use rates. A hydronic radiant floor heating system normally runs less than $3 per square foot.